For nearly a millennium, your family may have been missing one of the great religious pageants in Europe. The Procession of the Holy Blood (known as Heilige Bloed in Flemish), a remarkable public celebration of a relic believed to have been Christ’s blood, has been held annually since 1150 in the medieval city of Bruges. This year on May 29, 2014 at 12:30pm, a parade made up of 1,500 Belgian citizens from Bruges and the surrounding Flemish countryside will walk through the old town with their relic of Christ, said to be some blood, past thousands of spectators from all over the world. The relic, enclosed in a gold and rock-crystal flask, only leaves the Church of the Holy Blood, a 12th-century Roman Catholic chapel, once each year. Historians believe that accounts of the relic of the Holy Blood date to 1256, though others claim that Bruges has celebrated its presence in their town since 1150. It is widely agreed that another relic of Christ’s blood existed at that time in Constantinople (known today as the city of Istanbul), and it was kept in the Maria Chapel of the imperial palace. After Constantinople was sacked around the beginning of the 13th century, the Crusaders took control and Baldwin IX, Count of Flanders, was chosen as the region’s new emperor. According to the Relic of the Holy Blood website, it is thought that Baldwin IX had his troops loot the city’s treasures and, during this time, the relic was brought to Bruges. Even today, it is contained in a flask that is thought to be of Turkish design, appropriate to that era. Over time, according to the Flemish, the procession of the Holy Blood has come to symbolize man’s existence and the meaning of life. The parade participants march in four different parts, each representing different epochs: The Old Testament, The New Testament, Historical Section, and Veneration of the Holy-Blood. For more information on how you and your family can take part in the event or just watch this amazing spectacle, visit the Flanders Tourism Bureau website and plan ahead. (If late May is not when you plan to visit Bruges, check out the church’s website because visitors may enter, and even attend a mass, during certain periods of the week, year round. 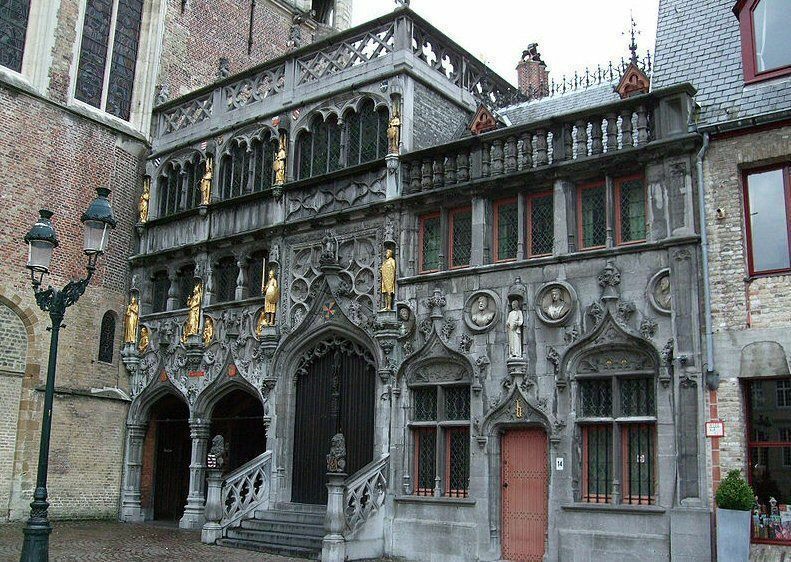 ; if so, grab them as lodging is always a problem in busy Bruges, and it’s at a premium at this time of year. Photo of the Church of the Holy Blood from wikimedia commons.